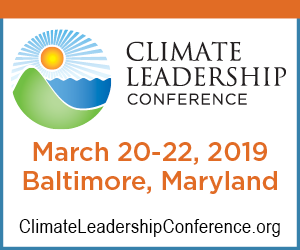 Join us March 20-22 in Baltimore to connect with the nation’s thought leaders and decision-makers at the 8th annual Climate Leadership Conference (CLC). The CLC convenes around the prestigious Climate Leadership Awards and brings energy and sustainability professionals together to address climate change through policy, innovation, and business solutions. WRI, CDP, WWF and UN Global Compact are co-hosting the workshop Scaling Collective Action: Best Practices for Setting and Achieving SBTs in the Value Chain on Wednesday, March 20th from 9:00 – 10:30am. View program agenda and current speaker line-up to engage, learn from and network with the nation’s leaders on climate.